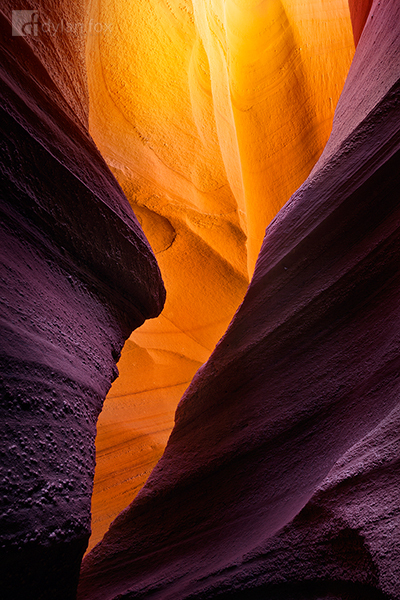 Antelope Canyon in northern Arizona is a spectacular place to photograph. I was thrilled to have the opportunity to visit these slot canyons and witness the spectacular glow that is found within them. 'Arcadia' captures the variance in colour temperatures within the canyon that are seen more dramatically by the camera as the intense warm light reflects off the background walls and the foreground rocks appear in much cooler light. A stunning location that I do hope to visit again one day! Secure your limited edition, Antelope Canyon photographic print, 'Arcadia', by selecting your desired print size in the menu to the right.